HARRODS. To celebrate the launch of the Harrods of London collection, Harrods invited me and seven lovely ladies to each style a look featuring one piece from the collection. I chose this gorgeous black dress made out of butter-soft leather and paired it with a bag from Sophie Hulme + a pair of strappy heels from Nicholas Kirkwood. More pictures below! This entry was posted in Outfit, Travel and tagged Harrods, Harrods of London, leather dress by Carolina Engman. Bookmark the permalink. Amazing pics! Looks like you had a lovely day. Great shots! Your hair looks fab like this! New look-> YELLOW sweater, FLORAL pants and a STATEMENT necklace. absolutely awesome. your hair looks gorgeous! You are so so pretty!!! Nice pictures and nice place dear!! Kisses from spain!!! Amazing! The dress looks stunning on you – I want one! You look fabulous and this is such a cool project! You look amazing with that haircut, and I really love the outfit you choose! wow, that dress looks stunning! and also like your styling! What do you think about having liked each others Facebook pages? I would really appreciate if you like my Fb blog page. I’m trying to expand my Fb followers. Love ur blog so much. You’re rocking this hairstyle! sO GOOD! I love that hairdo on you :) It fits you so well. You all look so beautiful! I’m rather jealous of the room you got to stay in, it looks rather swanky. You look totally stunning in that black dress!!! Great photos for my coffee break! you look so so beautiful when you smile! It’s amazing! i love the photos! I think you will look amazing also in my designs!!! I'm a medical student and a fashion blogger. New post on my blog, check out the hottest trends for spring-summer 2014! Stunning dress! You look adorable! Love the hairstyle! Wow you all are so fashion! 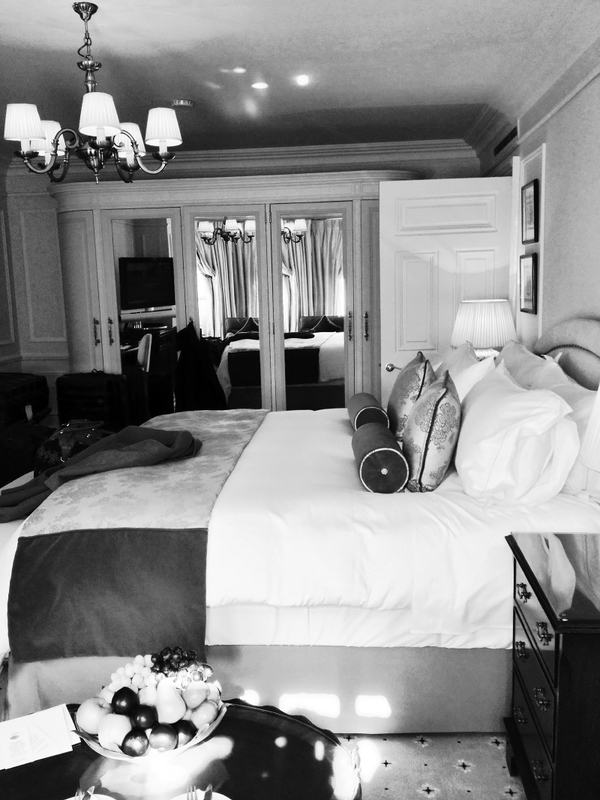 The hotel room looks incredible, I am jealous! Beautiful choice! The leather on that dress looks too beautiful. And the shoes… Oh those shoes! Gorgeous! You were in great company… But your styling choice is definitely my favourite. Absolutely stunning! Love that dress and especially how you styled it. You look amazing!! I love that dress soo much. Gorgeous! The leather dress is perfect! Your hair looks GORGEOUS! Love yours and Jess’ hair! Any chance we can get some info on the styling/products? Hi!!!! :) I like it so much your new hairstyle!! Y have new design in my blog http://re-creandome.blogspot.com.es/ take a look!! Color of the year makeup today on my fashion blog http://heavenisaplaceonline.blogspot.com/ Please follow me and I’ll follow back! Leave a comment to let me know what you think, I’m new here! You all look amazing. I love the hills! I think you chose well. So stylish. I’m loving the butter soft leather look too. Wearing a leather skirt on my first blog post. Looking awesome! Love the heels! Yoy look stunning with this haircut! I love it! And very nice shoes! You look gorgeous, and your hair is so stunning! You look gorgeous. Beautiful outfit! Look extremely beautiful in the black and white photo. This is a perfect make+hairstyle for you! I just discovered your blog, i really like it!